I began with an accumulation, a sense of something, and this question: What is the significance of ‘refractive poetics’ for artists who identify with the margins or address alternative modes of seeing? Last week I considered the relationship between Otherness, liminality, and the body as a meaning-making agent: the truths of a marginalized person are shadow truths in our society, which perhaps in our prevailing terms can only be accessed underwater or at a slant, or a brief ephemeral moment when the light is catching at just the right angle. This week and next week: Perhaps some artists cannot afford to believe that aesthetics are not inextricably tied to politics. To break, shatter, block, suspend, interrupt, syncopate, modulate, distort, disperse. 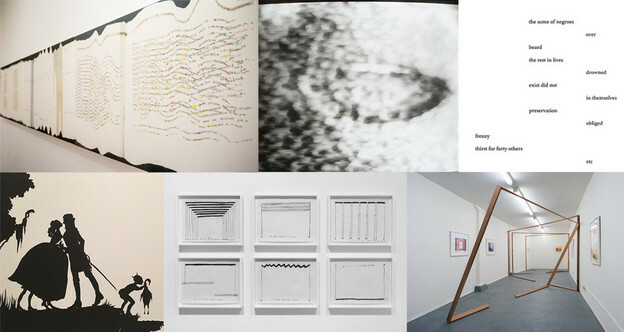 Each of the artists I examine offers a vision of truth and experience predicated on rupturing our dominant frameworks (of: language/text, sound/silence, linguistic identity, frameworks and home-spaces, history and archetypes, documents). Meaning in their artwork is made not by simply replacing one perspective with another, but rather meaning hinges on a moment of interruption, so that the through-line of the original reference continues but is noticeably altered, and the shadow of the ruined reference looms. In refracting some status-quo notion or term, the fact itself of disrupting is intentional and central. Thus, Lyle’s oblique architectural constructions hold meaning for us because in them we simultaneously experience the unsettling of “standard” and “foundational” frameworks. Kim’s blurring of sound/silence haunts us as it excavates a common concept. Cha’s insistence of language as texture is powerful because we expect to think of language in phonetic terms. Walker’s silhouettes are jarring in the wake of a ruptured romanticism. Philip’s erasure of a historical document is a meaningful contradiction of revealing as it obstructs, creating as it destroys. In all these works, we witness the sideways subversion of the normative point of reference by an alternative point of reference; we observe how the former falls short, how the latter expands. It is important for us to see the ghosts of the ruins, smell its dust. This disruption of the normative carries various forces of impact. In unsettling the status quo, it calls attention to the very fact of its existence, which we might take for granted otherwise. It introduces us to the possibility of Other ways of seeing, which were previously hidden from view. Furthermore, in breaking open the status quo, we are able to see what it is made of and what is alienated or lost (for example: Kim reveals our conventions and rules for sound; Walker underlines the grotesque violence of our histories, archetypes, and stereotypes). Moreover, each artist’s work implicates the audience as participants in resisting the dominant modes of seeing/being. Telling it slant is thus a way for these artists to deviate from and dismantle the dominance of normalized meaning. Refraction: a process that destabilizes the familiar and invokes the stranger; in which we knew the first and behold the second; where normative is broken into otherness. Quote is from Jill Darling, “Narrative Perversion,” Something on Paper, 3 (2016).